In support of Lung Cancer & COPD Awareness Month, Mediaplanet publishes Lung Health campaign found within USA TODAY and online, helps shed light on the third-leading cause of death in the U.S.
Nearly 34 million Americans are living with some form of lung disease, which is the third-leading cause of death in the US. 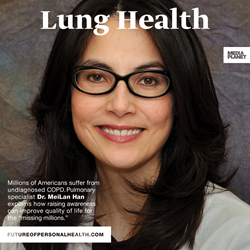 Helping to conclude Lung Cancer & COPD Awareness Month, Mediaplanet today announces the launch of this November’s edition of “Lung Health.” This campaign will inform readers of both widespread and relatively unknown lung diseases and cancers through patient stories, industry expert insights, and more. Nearly 34 million Americans are living with some form of lung disease, which is the third-leading cause of death in the US. However, even with these daunting figures, the industry is heading towards a brighter future of better lung health, including: more options for early detection, better treatment for every form of lung disease and extensive research. In partnership with medical professionals, industry experts and patients themselves, this campaign will showcase the future of this industry and provide hope that those suffering from any form of lung disease will be able to breathe better. The print component of “Lung Health” is distributed within today’s edition of USA Today in New York, Chicago, Los Angeles, Atlanta, Southern Florida, Phoenix, Houston, and Cleveland/Pittsburgh markets, with a circulation of approximately 250,000 copies and an estimated readership of 750,000. The digital component is distributed nationally, through a vast social media strategy, and across a network of top news sites and partner outlets. To explore the digital version of the campaign, click here. Insights are shared from several leading associations, as well as patients, with the aim to educate, inform, and alleviate any stress readers may have about lung health. Article topics include: which tools patients can use to reduce their risk of lung cancer, tips for the average citizen to spread awareness of lung cancer, an inspirational tale from a Pulmonary Fibrosis patient, software innovations in lung health, how to identify undiagnosed COPD, and more. This campaign was made possible with the support of the American Lung Association, Boehringer Ingelheim, the COPD Foundation, Invacare, the Lung Cancer Alliance, the Lung Cancer Foundation, the Mesothelioma & Asbestos Awareness Center, the Pulmonary Fibrosis Foundation, the Pulmonary Hypertension Association, Sanovas, and Weitz & Luxenberg P.C.